campaign_name: This is the name you’ve given your campaign. 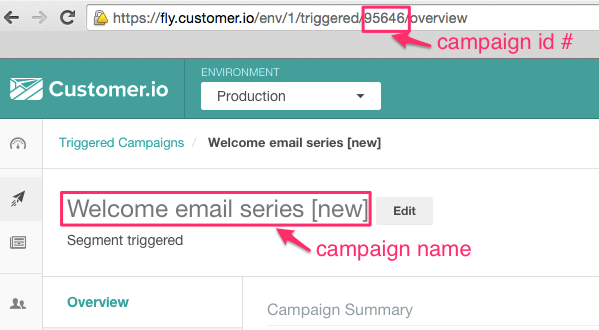 campaign_id: This is how we identify your campaign. You’ll see this id # in the URL of your campaigns. In case you change a campaign name, you can still rely on the campaign_id for comparing export data. template_name: This is the name you created for your email. template_id: This is how we identify your email. In case of email name changes, you can always use this template_id for comparing export data. Let us know what you think! Leave a comment or send us an email at win@customer.io. Want to keep up with more frequent product updates? Keep an eye on our release notes!